Charlotte and several surrounding communities were hammered by baseball sized hail on April 09, 2011. Along with learning about the effects of lightning damage to an ac, or even the HVAC damages caused by flooding, we had a question come in a from a reader in the Southpark area of Charlotte who asked Can Hail Damage the Air Conditioning system. After the storms went through their area, the AC stopped working, and obviously, hail was a suspect! In this Charlotte Air Conditioning and HVAC Guide, we wanted to take a quick look at hail damage and the possible effect on your AC condensing unit or packaged unit. Aside from the obvious cosmetic dings or small dents in the top or sides of your air conditioner, you really have to take a close look at several areas to be sure there are no other more serious ac damages from the hail. The air conditioner repair costs can add up quickly if you don’t take a few minutes to inspect the unit, or have a professional do it for you! The cooling fins that surround your condensing unit need to be in perfect order, for the air to flow between them and allow the proper functions of the heat being removed from the refrigerant. Hail can often bound into the side of the air conditioner bending the cooling fins flat, or when large enough, damaging the aluminum or copper tubing system that runs through the coil. The coil needs to be thoroughly inspected to be sure any flattened areas are combed out as well as inspected to be sure the damages were no more than cosmetic. The fan motor and cooling fan blades are a well-balanced and precisely pitched unit. If a large hail stone hit directly, or even near directly onto the motor or fan blades, it may still run, but long-term damages could occur due to wobbling, or the fan cooling system being out of balance. If one of the fan blades were bent, the unit may not cool properly, or worse, shed the blade when the fan is spinning. This would result in a catastrophic failure of the entire ac unit. Thermostat wiring and high voltage electrical connects the air conditioner to the home power and indoor thermostat. If a large hail stone hit on the wires, it may have damaged the wire or caused the connection to break free. Even though the copper lines that connect the outdoor air conditioner to the inside coil are somewhat flexible, a sudden jarring blow from a large hail stone could easily rupture the soldered connection and allow the refrigerant to leak out! The cost to recharge a home air conditioner can be hundreds, or even more than a thousand dollars if the ac repairman cannot find the leak in the system! Package units connect to the home duct system directly outside the house. If large hail pounds on the shield or the duct connections, it could easily jar the duct system loose from its otherwise tight connection. This area should be inspected for proper fit as well. 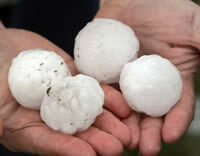 In most cases, air conditioner damages caused by hail are covered under your homeowner insurance! The internet is full of stories about claims adjusters telling homeowners that the damages are only cosmetic and no long-term damages can result from hail. Don’t accept this answer from your insurance company and always spend the time to have your system inspected after a hail storm like we saw in Charlotte. If ANY Damages are Found, Call your Insurance Company and File a Claim! Did You Suffer Hail Damage to Your Air Conditioner? We love hearing more from our Charlotte neighbors… If your home was in the hail zone and you think you suffered hail damage to your home air conditioner, share the story below! our gas pack was pretty beat up by the hail the other night and the insurance adjuster agreed to pay for a full replacement. On both sides where the ac coil was visible, the ice chunks beat it up real bad with one of them bending the copper and aluminum to the point that all the coolant leaked out of the system. Your price estimator was very close to spot-on for the new system and the company charged us 3800 for a new one, installed. Insurance paid 4200 and it covered the full system. Thanks for a great info source, Red. Thanks for the great info about your hail damaged package unit and sharing that your insurance company paid for a full replacement. 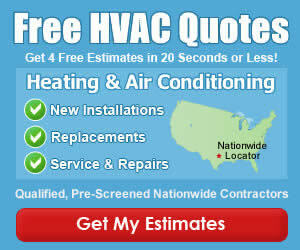 If you don’t mind, please browse to the HVAC Contractor Reviews page, locate the company that installed the system for you, (or tell us if its not there) and provide a brief review of the service you received. I started doing my reecrash for a portable air conditioner when my central air went out (in 103 degree heat) and I found out that it would cost me $3500.00 to get it replaced. I have a 3 bedroom home but spend most of my time in the living room. I came across the Danby portable air conditioner and read the reviews. All of the reviews gave it 5 stars, so I bought one. Overall, the Danby is great for cooling one room. I do have one problem with it. There are 2 exhaust tubes, that go into the attachment for my sliding glass door. I have had problems keeping the tubes in their connections to the outside, other than that, I would recommend this air conditioner. We got hit pretty bad with the hail storm too, My AC unit do not even work any more it is only blowing out warm air but before this it was working fine. I almost fell out yesterday it was so hot and the AC was just barley working. On 10/05/2010, we got hit pretty bad by hail, wind, rain and lightening storm In Scottsdale, Arizona. The hail stone were 2”- 3” thus causing damages to the roof, skylights and A/C. My roof mounted Goettl Heat Pump A/C were damaged. After the storm, I smelled this terrible electrical odor coming from the interior A/C filter vent. I had several contractors inspect the A/C units, all said that the dents in fins were damaged by the hail stones thus causing the unit not to work. However, when I replaced the unit it was noted that the electrical wiring on the roof leading to the termostate were severely burned. The flat roof was flooded with several inches of rain water and hail. I reported this claim to my insurance company, I told them that I smelled this electrical odor coming from the A/C. I trace the smell to A/C vent in the interior hall of my home. My insurance company did l not honor my claim, because they felt like the dents in fins were created mechanically. After replacing the A/C with my own money, the Goettl techinician felt that the water from the storm cuased an electrical shortage thus burning the wires resulting in the electrical smell that I reported to my insurance adjuster.